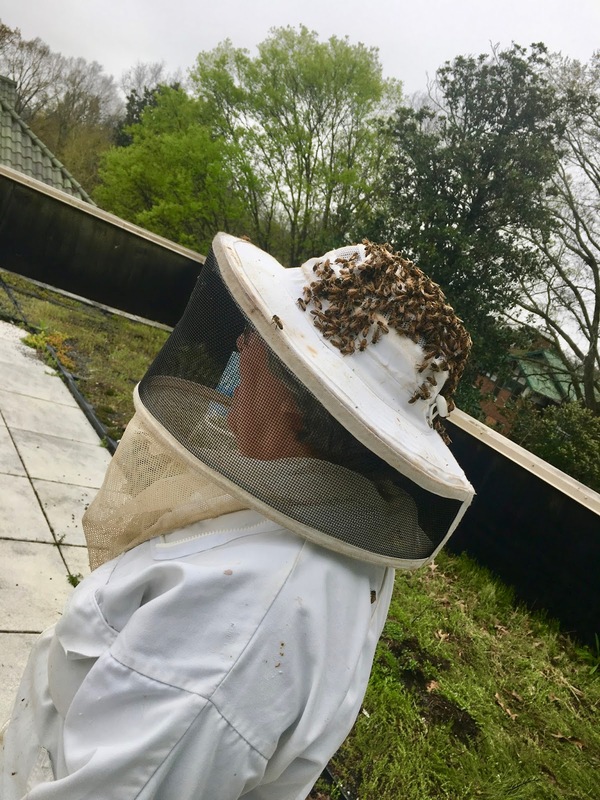 I've always been fascinated with Brother Adam, who spent much of his beekeeping life developing the Buckfast bee (named for the Buckfast Abbey in England where Brother Adam lived and kept bees). The Buckfast bee was developed for gentleness and good survivability. Last bee season I killed my best colony. I didn't write about it because I was so, so ashamed of killing such a great colony of survivor bees. I had had them for about six years. I was trying to follow the plan of splitting your colony after the harvest to go into winter with extra colonies in case you lost any over the winter. I needed help to do it (I couldn't lift hive boxes last year because of a shoulder injury) so I waited about two weeks too long. By the time I split the colony, making three three frame nucs in my queen castle, we were in a dearth. All three splits were robbed out and killed. I must have moved the queen to one of the splits by accident because the original colony was unable to make a new queen. So the three splits and the strong original colony all died. That meant that going into winter, I only had one colony - a four-year-old hive that developed from a swarm I caught in my own neighborhood. My friend Julia told me that a man from Wisconsin who had Buckfast bees was driving through Atlanta from Florida and still had some nucs available for purchase. 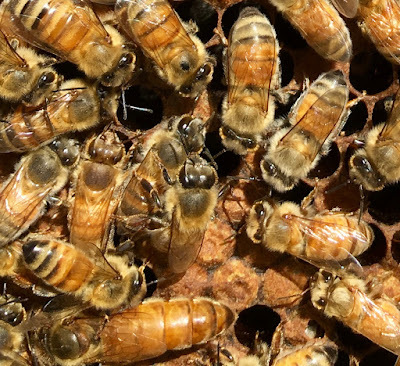 The company was Fox Honey Farm and they were driving a flatbed truck through Atlanta with bee pick up between 5AM and 7AM on Saturday, March 17 in a Walmart parking lot on Cascade Road. What an adventure! I ordered two - one for my bee-lonely backyard and one for a yard where Jeff and I are to be the beekeepers this season. And then I set my alarm for before the crack of dawn and drove very carefully to the Walmart parking lot. It's amazing how many people are shopping at Walmart before 6 AM! Later that morning a high school student whom I am mentoring and I installed the two nucs. 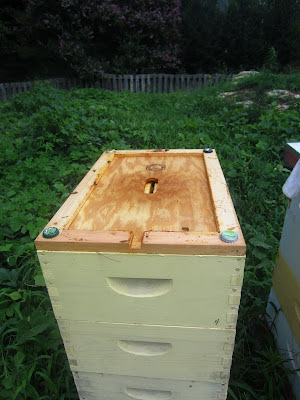 First we opened the entry and set the nuc that was staying at my house on top of the hive where it would live. Then we drove over to the house near Emory. Aaron who was working with me had opened a hive with me before but he had never done a nuc installation. So he handled a lot of the hive installation at the house near Emory. As I'm sure you know, you don't need a smoker during an installation, but we do use hive drapes to keep the bees as calm as possible. This was a very calm nuc and the installation went well. 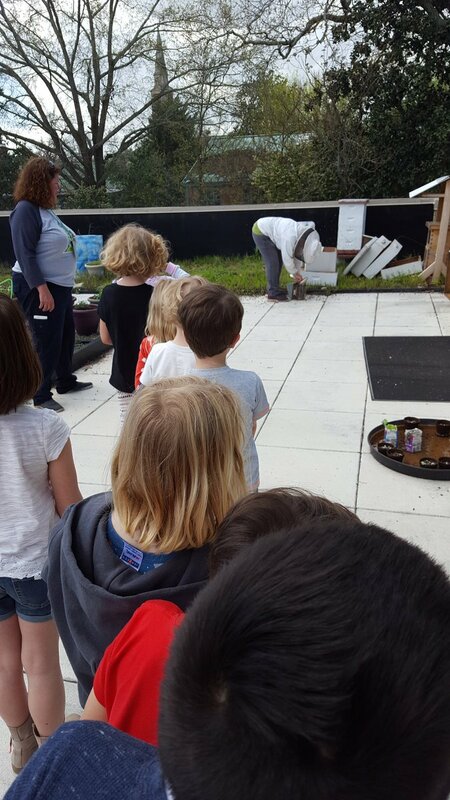 When we finished, the bees were starting to explore their new environs. 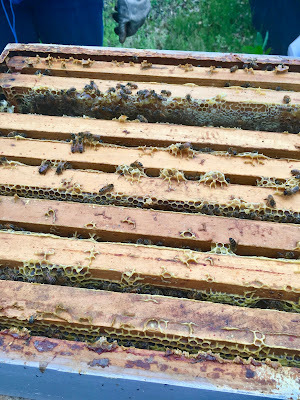 This old hive is right next to the hive in which we installed the nuc. It is unoccupied and the beekeeper who owned the hive has, as I understand it, left the country. It had three different sized boxes on it. I saw bees flying in and out of it - scouts looking for a new home, I'm sure. While we were there, we moved the shallow boxes off of this hive so if a swarm should decide to make it their home, we wouldn't have to deal with three different types of boxes. Then we returned to my yard and installed the Buckfast nuc there. In both nucs there were five frames of brood, a tiny bit of nectar and no pollen that I saw. I put a full frame of honey from my freezer into each of these installations to give the bees something to live on until the nectar flow starts in a few days or so. And then, following SOP, we left the nuc on its side facing the hive so that the remaining bees could join their mom and sisters. I went back to the Emory installation the next week and it was doing great. And I noted that the bees were drawing comb as fast as they could on the empty frames in the box with the frame of honey. Live long and prosper, Buckfast Bees. I'm counting on you. 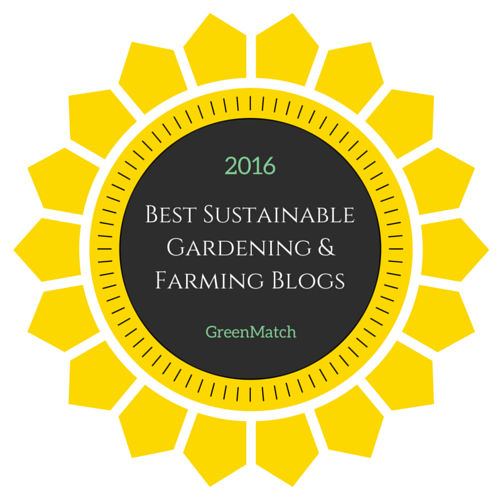 I tell people with pride that I write on this blog about all the mistakes I make because I think it helps other beekeepers to learn from my errors. Well, here's another one. Why are the bees clustering around the top? Well, the beekeeper (that would be me) had, at the last second as I was leaving when I was there before, pushed the entrance reducer into the front of the hive. Unfortunately, it was a homemade entrance reducer made by the last beekeeper and while I thought I was turning it so the large entry would be open, it in fact only had a small entry. I had left the hive totally closed in the front. I pulled the entrance reducer out and there were dead bee bodies behind it. Did this mean the hive was dead and the bees clustered around the top edges of the hive were marauders? We only had a limited period of time so we set to work on the other hive and left the unknown answers still a mystery until we had done our hive move on the other hive. Hint: the hive was alive - three weeks after I had closed up the front entry - can you imagine why? (Will tell at the end of this post). So we went to the other hive which was already in a combination of medium and shallow boxes to move it into all medium boxes. This hive, too, had problems. Three of the boxes had removed frames which the bees had filled with capped drone comb. In each instance, we just cut the drone comb off of its support and I brought it home, put it in my front yard, and fed it to the birds. In the photo above you can see one of the spaces. We pulled off all of the old rotting boxes and replaced them with my old medium boxes, newly painted white. We moved the frames one by one and transferred them to the new boxes. The three missing frames made our job a little easier and we made a split into a cardboard nuc as we went through the frames. The hive, crowded as it was, was preparing to swarm so we found at least two frames with queen cells, capped and fairly light in color. I put a frame with one queen cell into our split as well as some frames with eggs to give the bees the best chance. This hive was boiling over with bees and we had bees all over the removed equipment and even on my hat. This is how it looked at the end. I had thought the hive had three boxes on it and I only brought four boxes with me. Turned out, the hive had four boxes on it so we actually left it still rather crowded. I came back the next day, popped the top and added a fifth box, moving three frames of honey up to the new box and adding empty frames in their spaces to open up the honey dome. 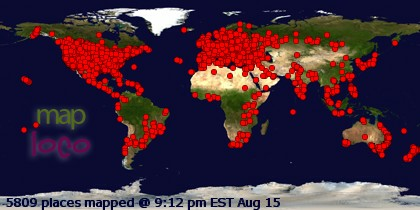 This photo is from a post on July 20, 2012. The beer caps are usually propolized by the bees and raise the top cover about 1/4 inch - the height of the beer cap. The hive we are discussing had these propolized caps in the corners of the top cover. That little 1/4 inch was enough to allow the bees to enter the hive through the top. 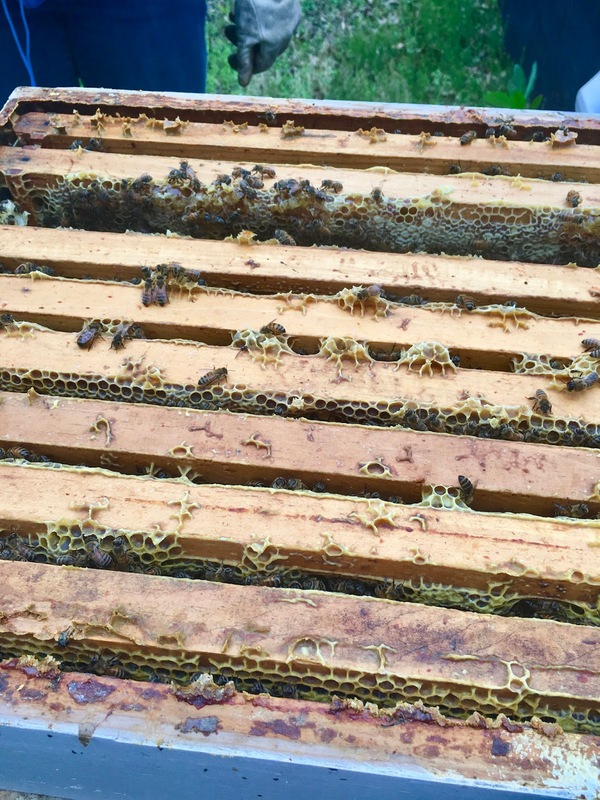 We didn't inspect this hive but opened the top and took off the inner cover before we left. It was boiling over with bees. As I left with the hive wide open in the front, I noticed the bees were using what they now claimed as their entrance, going into the hive under the telescoping cover! They'll probably use the front door once we move that second hive into new boxes next week! So despite two major beekeeper errors - leaving the queen excluder on all winter and plugging up the front entrance for three early spring weeks, this hive is quite a live one. And I feel lucky. 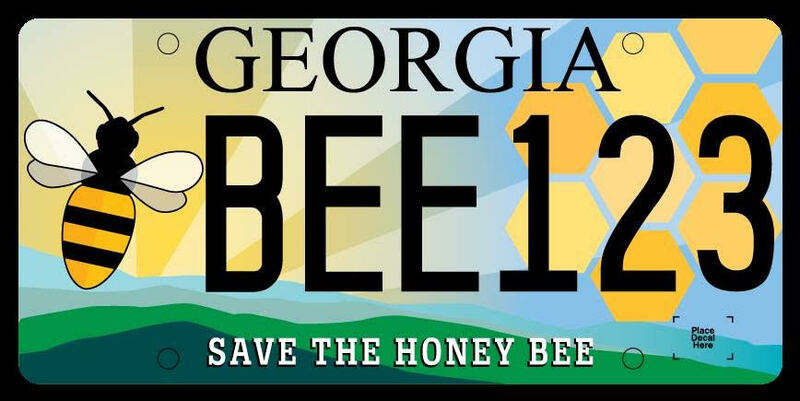 This gorgeous license plate is moving through the Georgia legislature for passage this year. It passed the House unanimously 168 - 0. Today the bill is in the Georgia Senate committee process. It just passed unanimously through the public safety committee and now goes to be voted on in the Senate, I believe. The judges had the final entries printed up to actual size and held them up to license plates of cars so their visibility could be determined. It was a great system because I have frequently had the experience of trying to decide what the car in front of me was representing in their specialty license plate because it was hard to see. This one is easily read; the honey bee, while stylized, is as accurate as possible; and the colors are striking. My dear friend, Julia Mahood, often mentioned on this blog, was the winning designer! We won't know the details of ordering the plate until it has passed the Senate, but if you are a Georgia resident and are interested in knowing when/how to order, you can put yourself on a list to be notified when we do have the instructions for doing so. Just click here. UPDATE: On Wednesday, March 21, as spring and bee season begin, the Georgia Senate passed the honey bee license plate 51 - 0. Now it goes to the Governor's office for his signature.